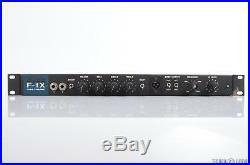 Alembic F-1X Tube Bass Preamp Mono Pre-Amplifier F1X #30333. PRODUCT DESCRIPTION: This listing is for. F1X Tube Bass Preamp Mono Pre-Amplifier. The Alembic F-1X is the mono version of the F-2B preamp. Includes a standard full range output. F-1X gives you a unity-gain impedance matching amplifier to feed guitar-level effects units. The effects return goes thru the tube gain stage and then to the tone controls. The signal from the tone controls is amplified and sent to the full-range output jack on the rear panel. This same signal is also fed to the crossover network. A transformer-isolated output feeds a 3-pin Cannon jack. ACCESSORIES INCLUDED: This item includes a power cable. This item comes only as seen in. And does not include any other accessories. PHYSICAL CONDITION: Good- This pre-amp unit has minor scratches on the sides of it. One of the unit's rack ears is moderately bent and has paint chipped off of it. The frequency knob is missing a cap but works just fine. Lastly, the branding on the unit has a bit of wear consisting of paint deterioration. Overall, the pre-amplifier is in good condition. WORKING CONDITION: Fair- Solid, reliable tone in a compact package. This amp's straightforward configuration is lined with a nice handful of useful features, all of which find their knobs & respective switches to be in clean, consistent working order. The output of this preamp has a high noise floor and a few odd background noises that pop in, so this unit is best suited for practice. The XLR out on the front doesn't work, but the rear output works just fine. UNPACKAGED DIMENSIONS: 19" x 2" x 8.5. We strongly suggest that you check your order after receiving it to be sure that it is in proper working order. NOT WORKING FOR PARTS AS-IS. We do our best to fairly evaluate the condition of a non-working item and give an honest description of any symptoms. If there are any further conditions, missing parts, or dead-issues with the item that are unknown in this type of listing, we will not be held liable for it. It does not cover such things as normal wear and tear. Incorrect voltage, un-authorized or self-repair, moisture damage, failure to follow manufacturers instructions or incorrect application etc. Acts of god, the old gods and the new gods, forces of nature, items with removed serial numbers, microphone ribbons, speaker drivers, capsules, batteries, tubes, bulbs, damage resulting from the use or misuse of voltage regulators, losses incurred from loss of business, clients, down-time, profits or for personal inconveniences or expenses in travel, gas etc. We also accept all major credit cards. Please inquire for a special quote. Direct signature on packages is an option. Packages lost due to theft are not the responsibility of Techno Empire Inc. Examine all boxes upon receipt by the carrier before acceptance. Carrier must note any damage to the box on a release form or you can refuse acceptance. Any items that you receive that have exterior damage to the box or damage to the item, or missing parts or accessories, please report this immediately to customer service at Techno Empire. Please keep all packing materials, accessories and merchandise tags for any item you want to report a claim. Please inquire for rates if you do not get a rate from the calculator. Techno Empire will not be responsible for any packages that are lost, stolen, or damaged in International transit. This includes all packing materials, accessories, manuals and related documentation. Return items must be repackaged for safe return with the same care in which you received it. Return items must be insured for at least the full value of the item. When you receive an item, open the package using a box cutter and be mindful not to tear up or throw away the box or any internal packaging. Without having to curb your enthusiasm of basking in the glow of your new piece of gear, think in terms of preserving it in its mint condition until certain you are keeping it. For instance, if it were rack gear, we would recommend avoiding racking it until you were certain it was a "keeper". Thus preventing any possible "rack rash" or scratches. If it were a guitar pedal, avoid sticking Velcro on it and mounting to your pedal board until it passed your test to be knighted and sit at your round table of pedals. Although tempting to have both of your favorite things together, put down the chicken wings slathered in barbecue sauce that is dripping all over your leather vest and beard and be sure your hands are clean and dry before trying out your awesome new gear. Pet odors, cigarette and other smoke items can also affect the "newness" of your gear. Incorrect voltage, self-repair, exposure to extreme temperatures, moisture damage, or incorrect application, etc. Earphones, microphones or other items that have intimate mouth, face or body contact. Software, computer hardware, computer drives and other digital or media tape. Items that are special orders, discontinued, or closeouts, are all non-returnable. HOW TO RETURN YOUR ITEM. The item "Alembic F-1X Tube Bass Preamp Mono Pre-Amplifier F1X #30333" is in sale since Friday, November 24, 2017. This item is in the category "Musical Instruments & Gear\Pro Audio Equipment\Preamps & Channel Strips". The seller is "technoempire" and is located in Burbank, California. This item can be shipped worldwide.